o	He did not own a bed : he prayed all night long. The authors of the Rossanius Codex wanted their readers to identify with Dominic’s prayer and to transmit it. What a treasure they left us ! During this retreat, we are invited to learn from these “icons”. Two words summarize this stage : the acceptance of ourselves, of our limitations and shortcomings ; the welcoming of God in us, of what we are called to become, as though the Lord were saying : “Free yourself from yourself, and let me enter.” The second word about this stage is a preposition : with—with the Lord, with ourselves, with others. 2) His uplifted hands signify ecstasy, a standing “outside of self”. He asks for the gifts of the Holy Spirit for his brothers. The preposition in applies here : in Him. One word summarizes this stage : the gift. One preposition applies here : for. 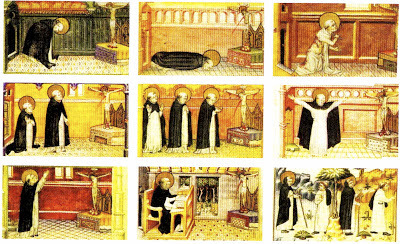 The goal of these nine ways of prayer is that we discover how to reach our own interior dwelling. 	We are invited to ask ourselves that question. We can begin by considering four great emotions that arise every day : fear, sadness, anger, joy.